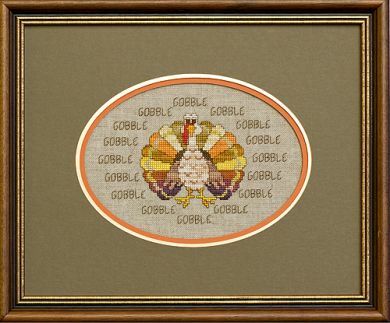 Stitch a sassy turkey with feathers full of fall colors and lots of gobbles! Another small design that features full stitches, Weeks Dye Works or The Gentle Art variegated floss, and two colors of Kreinik metallic braid. This one is simply enjoyable and relaxing to stitch. A nice break from some of your more challenging projects. Fabric: Stitched on 28 count Natural Linen (76B) by Wichelt Imports, Inc., available at your local independent needlework shop. Materials Summary: Uses a total of 13 colors of Weeks Dye Works, 1 color of Anchor/DMC, and 2 colors of Kreinik braid. NOTE: Model stitched in Weeks Dye Works. Best color match of The Gentle Art floss is provided. However, when working with over-dyed floss from different manufacturer’s, obtaining an exact match of a color between two different lines is impossible. Therefore, if stitched in The Gentle Art floss, it will look slightly different than the photo on the cover.